You know you’ve made an impact on history when your face is placed on U.S. currency. James Madison’s face was on the $5,000 bill, which is no longer used, but was printed and circulated at one time. As the fourth president of the United States, James Madison was instrumental in shaping the nation’s government, particularly through his involvement in helping to draft the United States Constitution, as the author of the United States Bill of Rights, and as co-founder of the Democratic-Republican party along with Thomas Jefferson. From an early time, Madison had weak health and constitution. However, like Jefferson, he was dedicated to his studies, and at 16 he enrolled in the College of New Jersey, now known as Princeton University. During his two years there, he studied Greek, Latin, science, philosophy, geography, mathematics, and rhetoric. Following his graduation, Madison stayed on at Princeton and continued further studies in Hebrew and political science. Madison did not get married until age 43, and then he married widower Dolley Payne Todd, who was 26. Dolley Madison may not have been the pioneering first lady at the White House, but she was the first one to bring her social graces to the role and increase Madison’s popularity as a result. Unlike many of his contemporaries, Madison began his political career at an early age. Because of his weak health, Madison did not fight in the Revolutionary War; instead he served in the Virginia State Legislature. In 1987 Madison helped put together a national convention in the hopes of drafting a constitution and fixing the Articles of Confederation, which many believed were weakening the nation and federal government as a whole. Before the convention began, Madison drafted the “Virginia Plan,” which was later used as a basis for the Constitution and which pushed for less sovereignty for states and more sovereignty for the national government. During the convention, Madison kept a record of what occurred, which has been used by historians as the only comprehensive record available. As president, Madison originally sought to expand the programs started under Jefferson; however, some of his original views changed throughout his presidency. For instance, Madison did not believe in a federal bank and when Congress did not reauthorize the First Bank of the United States’ charter, he did not push for it; he then later vetoed a bill to charter a replacement bank. However, during the war with Britain, he quickly learned that without a national bank America was weak, and he later signed a second bill to charter a new national bank. After the war, a time of peace and improved economy descended on the nation. During this time, Madison passed a variety of measures for national improvement, including federal funding of roads and canals. 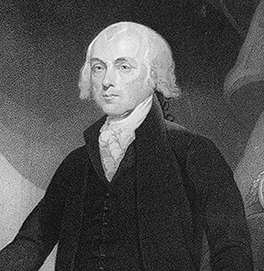 James Madison was only 5’4″ tall and is estimated to have weighed roughly 100 pounds. This makes him the shortest president in American history. In his old age, Madison became obsessed with his historical legacy and many of his documents, letters, and writings contain changes made by him in order to appear in a better light. This included changes to days, dates, words, sentences, and passages written not only by him but others as well.